One day someone will likely assemble a highlight reel of the many variations of this extraordinary shot by this extraordinary athlete. If this highlight reel exists today, I could not find it on YouTube. As much as I enjoy seeing this shot, it scares me a bit, too, possibly because I know that I am a closet klutz. Recently, while walking down the subway station’s steps, en route to work, I narrowly missed tripping over a woman’s gargantuan handbag that she was carrying so low, it could have doubled as a weapon of major destruction. Had I caught my foot in her elephantine-sized satchel, I would have taken a flying leap down the rest of the concrete stairs, broken my nose and probably several select slow healing bones, as well as shattering my glasses, before tumbling onto the tracks into the third rail, and proceeding to fry to death while suffering extreme embarrassment. I listened to my inner mother’s warning to resist doing anything idiotic, and ignored the urge to pass this blockade on feet but by practicing restraint, I did miss my train. Back to daredevil Roger, I know well that he is an elite athlete, and although I am not a male of the species, my ovaries always jump into my throat a little whenever I consider the tragic consequences if Fed did the unthinkable, misjudged the speeding ball and hit it high. Fortunately, this living legend has already fathered twins. 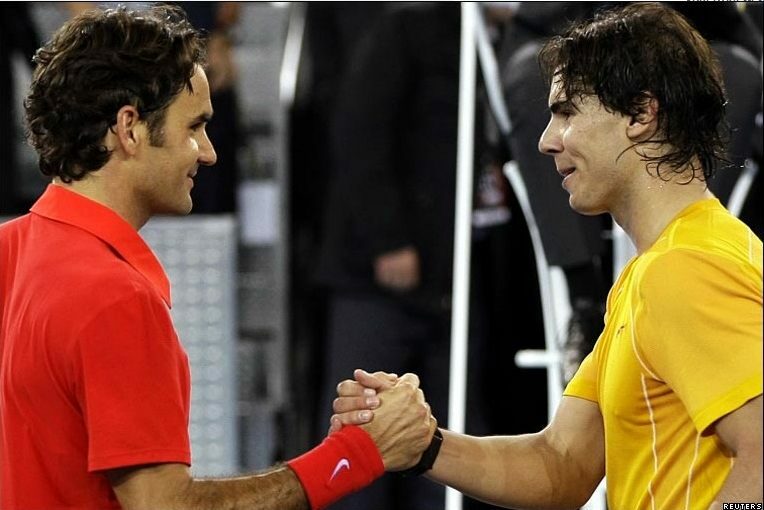 The tennis world's Fred Astaire, Fed, and Gene Kelly, Rafa, pressing the flesh; will they finally meet in the US Open this year? This entry was posted in Humor and tagged 2011 qatar open, between the legs shot, rafael nadal, roger federer, subway, tennis. Bookmark the permalink.